Dogs should run for the same reasons that humans do. It helps them maintain muscle and tone, so that their bodies do not turn flabby. It also helps dogs have a faster metabolism, and be healthier overall and have more energy. Dogs that spend a good deal of time indoors should spend time exercising or running, or else they will have stored up energy and may become destructive. When you want to get your dog to start running, don’t do it all at once. Start out walking short distances, and then long distances until you start to experiment with running. Do not take tiny puppies or older dogs, as they are not as fit to run. If you choose to run on the streets, run with your dog on your left side and go against traffic. Because dogs don’t have the protection of shoes, certain surfaces can be destructive. Asphalt is hot in the summer, and rocky surfaces may damage the feet. Grass is always a good option, for dogs and humans alike. 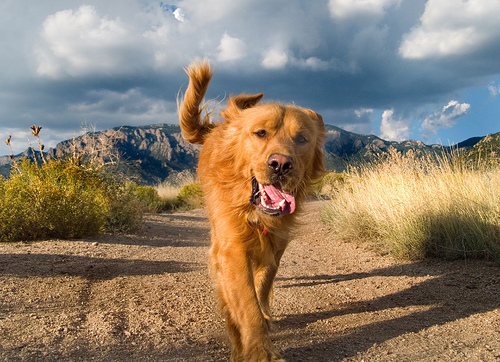 If your dog has serious health problems, avoid running. When you run in the summer, try to either bring water or run by a place where your dog can access water. If you run at night, wear something bright and attach some bright colored tape to your dog’s collar. Don’t try to take your dog out when the sun is blazing, it is better to go out in the morning or evening. Click here for more advice. If you and your dog are great running companions, check out some events. Dog Run Dog offers 5K and 10K runs for dogs and people, that could either be in your area, or could make for a great trip. So far this year there have been races in Saint Petersburg, Florida and Provincetown, Massachusetts. For instance, on September 20, there is going to be a race in Norwich, Vermont, going through the woods and through town. It is a quaint location to visit, with rolling hills and an old country general store in town. For the West Coasters, there will be an event on October 10 in San Francisco, California. They will be holding a dog run race on Crissy Field beneath the Golden Gate Bridge, next to the beautiful SF Bay. It will be virtually flat and very scenic! Some other races are still in development. Click here for the entry guidelines.